Hi! I'm Hariraj Sundaravadivelu and I live in Chennai, Tamilnadu, India. I graduated from SSN College of Engineering with Specialization in Computer science and Engineering. I write code for a living and currently work for as a Senior Software Engineer in Altimetrik. 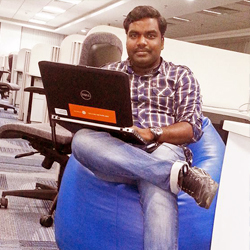 My past experience includes working as a Software Analyst in Bally Technologies, India, and as a Program Analyst in Cognizant Technology Solutions. I have an avid interest in web development. My main language for the last few years has been Java and I have worked in Java EE Frameworks Struts, Spring, Hibernate, EJB, etc.., My General interests include Reading, Blogging, Freelancing, Numismatics, Computers,Photography, Movies, Music,.. the list not being endless ;) This website is intended to provide more information about me, my skills, and accomplishments. Thanks for taking the time to know more about me and my professional experiences. MBA - General Management; Anna University, Chennai, India. B.E. - Computer Science & Engineering; SSN College of Engineering, Chennai, India. 'Star of the Month' � December 2011� Technology Practices Unit, Cognizant Technology Solutions. 'Extra mile award' from client �E-trade� � Q1 '12 � Cognizant Technology Solutions. Entered the final round for two successive years in IBM�s The Great Mind Challenge contest during my under-graduation. Won prizes in many National level Technical symposiums. 100% mark in Oracle Certified Professional, Java SE6 Examination. Volunteer in NSS and attended camp at Ellalur. A payments platform that handles transactions for digital goods in online games, Digital media, and social networks around the world. Analysis of business and technical requirements, prototyping. Involved in the development of a security framework for safeguarding web applications from various security threat attacks. Worked on various improvements for increasing the usability/performance of the transaction search feature available in playspan. Writing solid, clean code for implementation of Business functionality. Have a very good understanding of security threats faced by a web application. Tools and Technologies: Eclipse, JBoss, MS-SQL, Maven, Starteam, Java 6, SQL, Swing, SWT, Web services, EJB, Servlets, Hibernate, Jasper Reports. The gaming industry`s most accurate, reliable, and innovative slot-accounting, Asset tracking/management and player-tracking system. Implementation of Business/Technical requirements using Webservices, EJB, Hibernate, etc.. Developed strategic reports using Jasper Reports. Designed front-end using SWT and Java Swing. Performance tuning of the application using Jprofiler. Tools and Technologies: Eclipse, Tomcat, Oracle 10g, Maven, Subclipse (SVN Client),Java 6, SQL, Spring, Oracle Stored Procedures, Web services, Maven, Hibernate. This project provides streamlined, innovative support for the administration, tracking, and reporting of today�s complex equity compensation plans for companies to manage their shares. Development and maintenance of a multi-threaded Job processing system called TMS (Task Management System). TMS uses Executor framework and advanced multi threaded principles like concurrency, workflow, etc. Implementation of Business/Technical requirements using Webservices, Spring, Hibernate, etc..
Bug fixes of existing application. Tools and Technologies: Eclipse, Tomcat, Oracle 10g, Maven, Subclipse (SVN Client), Java 6, Web services, SQL, Spring, JSP, Servlets, Maven, Hibernate, Struts 2, Ajax, JQuery. This project provides a scalable and easy to use interface for Telephone department employee to track the usage of various incoming/outgoing calls and fax made by the Employees of the company. This system also seamlessly integrates with the payroll system to deduct the call charges from the employee payroll on a monthly basis for the peronal calls made by him. Design and implementation of Business logic using Struts, Spring, Webservices and Hibernate. Performance tuning and load testing of application using JMeter and Jprofiler. Developed an efficient algorithm for compressing real time videos by exploiting the redundancy between the video frames using Accordion method and built a web service for the same. A common online platform for Police, Citizens and Magistrates to perform interdependent activities like apply for caf�/hotel license, file a complaint, summon evidences, apply for a bail etc. Tools & Technologies : IBM RAD, IBM DB2, Rational ROSE, SVN, JQuery, JASPER, JSP, EJB, XHTML, CSS. Reading : The wise man reads both books and life itself. ~Lin Yutang. I'm just 26 so, I learn from the experience of others. I love to update myself with the latest trend in technologies so I read a lot. Please feel free to suggest me any good books if you find it intersting. Freelancing : I make my leisure time in a fruitful way by doing freelance projects. Music : Music is something we can all relate to, no matter what type it is. It's a universal hobby. I love melody and jazz type the most.A.R.Rahman and Illayaraja are my favourite musicians.